Andover, MA - MKS Instruments, Inc. (NASDAQ: MKSI), a global provider of technologies that enable advanced processes and improve productivity, has announced at SPIE Photonics West the Ophir® IS6D integrating spheres for measuring the optical power of widely divergent laser diode sources, such as VCSELs. Part of the Ophir Integrating Spheres series of products, the new spheres can accurately measure light that diverges up to ±85 degrees. 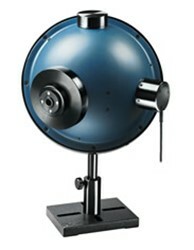 Each sphere is delivered as a calibrated unit with a photodiode detector. The IS6D-VIS/UV/IR measures powers from 300nW to 30W over wavelengths from 200nm to 1800nm. It has a 1-inch (25mm) input port designed to collect light at angles up to ±60 degrees. The IS6D-IR-170 measures powers from 20µW to 30W over wavelengths from 700nm to 1800nm. It features a specially designed gold-coated 8 mm input port that collects light at angles up to ±85 degrees. Both integrating spheres can be fitted with detachable apertures of 5, 7, or 10mm diameters to restrict the entrance of the integrating sphere to a particular light source; this reduces unwanted effects from the PCBs or carriers on which the light source is mounted. The apertures are magnetically attached to the port, making them easy to attach and detach. Each aperture is also coated with a special low reflectivity coating that prevents changes to the calibration of the integrating sphere. "VCSELs have widely divergent beams that require input ports to be adapted to wide angles as well as sources to be placed very close to the measurement sphere," said Reuven Silverman, General Manager, Ophir Photonics. "This can cause a multitude of reflection problems which can upset the sphere's calibration. The new Ophir IS6D integrating spheres feature detachable apertures that restrict the field of view so that only the VCSEL emitter is 'seen' by the sphere. They also include a special low reflectivity paint so as not to affect the accuracy of the measurement device." The Ophir IS6D-VIS/UV/IR and IS6D-IR-170 are available now. OEM prices available on request. Ophir is a brand within the MKS Instruments Light & Motion division. The Ophir product portfolio consists of laser and LED measurement products, including laser power and energy meters, laser beam profilers measuring femto-watt to hundred-kilowatt lasers, high-performance IR and visible optical elements, IR thermal imaging lenses and zoom lenses for defense and commercial applications, OEM and replacement high-quality optics and sub-assemblies for CO2 and high-power fiber laser material processing applications. Ophir products enhance our customers' capabilities and productivity in the semiconductor, industrial technologies, life and health sciences, research and defense markets. For more information, visit www.ophiropt.com/.